Barsana is a peaceful small town and an important pilgrimage centre for Hindus. 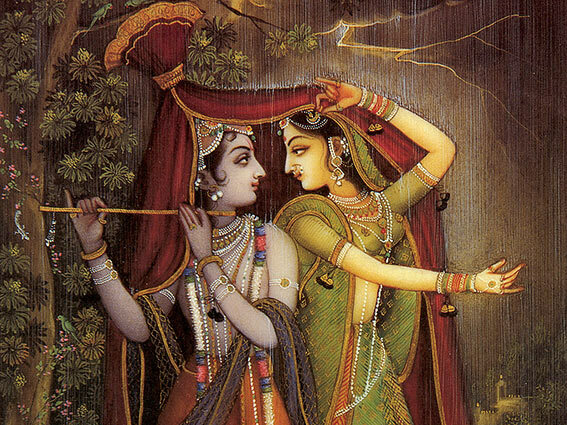 It seems still to resonate with the divine love between Radha and Lord Krishna. 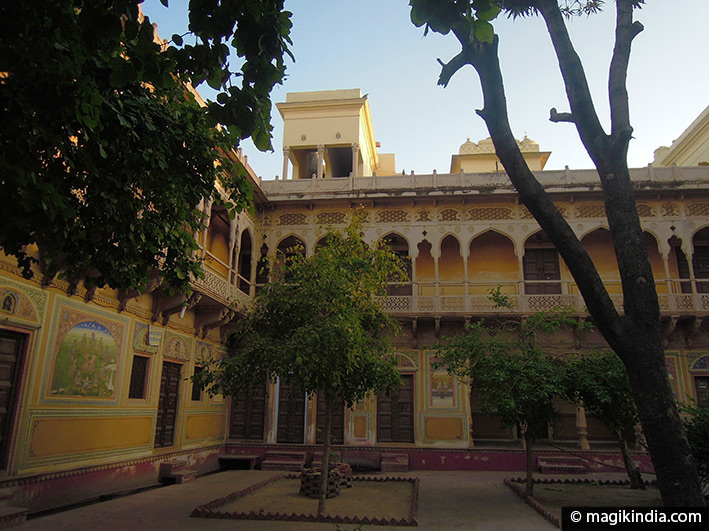 The “temple of the beloved”, built like a Rajput palace, stands majestically on Bhanugarh hill. Absolutely not to be missed if you visit Mathura and Vrindavan. 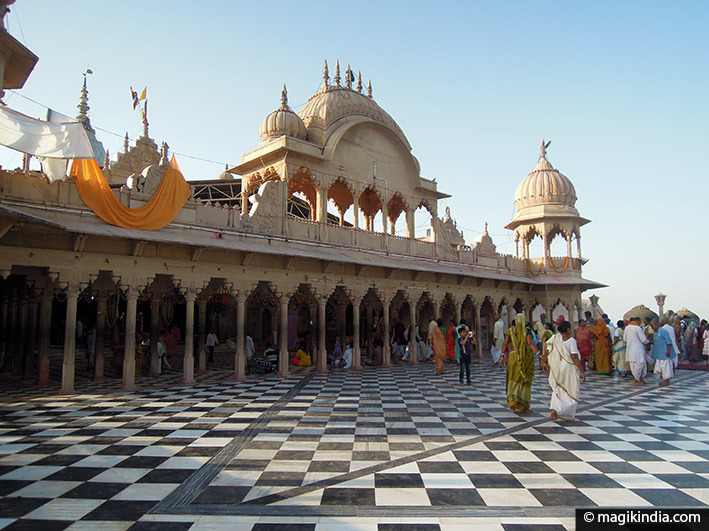 Barsana, 46km north of Mathura, is the town of Radha, Krishna’s beloved. It is surrounded by four hills which according to legend represent the four heads of the god Brahma. In earlier times the town was called Brahmsarin (sarin meaning “head”). The legend tells us that when Radha and Krishna came down to earth the Lord Brahma, Lord Vishnu and Lord Shiva decided to go too, to see observe the lives of the two divine souls. Lord Vishnu took the form of the Mount Govardhan and Lord Shiva the form of Nandishwara Hill in Nandagaon. Lord Brahma decided to live at Barsana, where each of his heads formed a hill. The Ladli Ji Ka Mandir or “temple of the beloved” is dedicated to Radha. It can be seen from far off, perched on top of Bhanugarh hill. 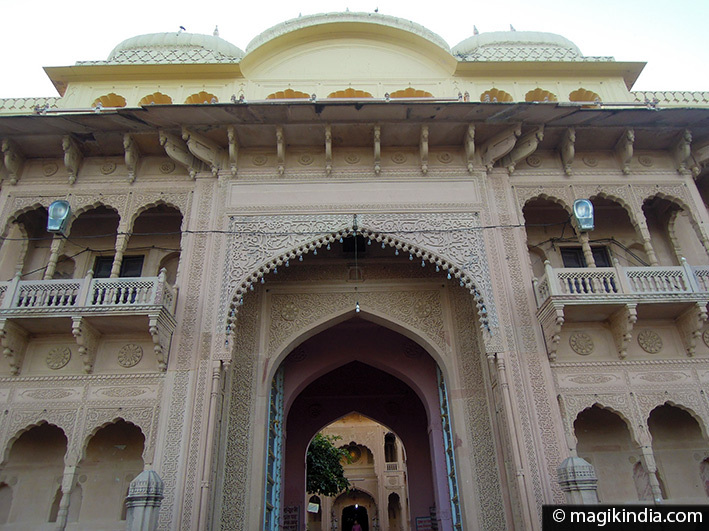 It is built in the style of a Rajput palace, with lovely, finely-carved arches and several domes. The main altar holds a gilded statue of Radha and a black one of Krishna. A fan has been set up in front of them; worshippers can pull on a string to operate it and give the two gods a cool breeze. The inside walls are painted with huge murals telling the love story of Radha and Krishna. Their divine dance or Rasa Leela is depicted on the ceiling. 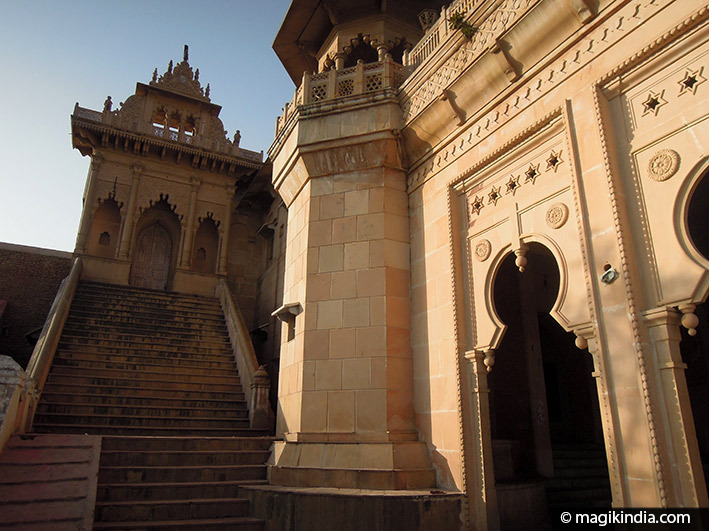 On a neighbouring hill stands the Kushal Bihari temple built by a Rajput king in 1870. Like the Radha Rani, it looks more like a Rajput palace than a temple. The ornamentation is particularly finely detailed. The sanctuary idols are Sri Kushal Bihariji (Krishna) in black stone and Srimati Radharani (Radha). Barsana is especially known for its festivities at Holi, the festival of colours. The town puts on a unique version of the festival, called Laddu Holi and Lathmaar Holi. It is an absolute place-to-be during Holi. Laddoo Holi celebrates Krishna’s visit to Barsana during Holi. It takes place on the day before Lathmaar Holi. Laddoos are ball-shaped sweets that are very popular in India. 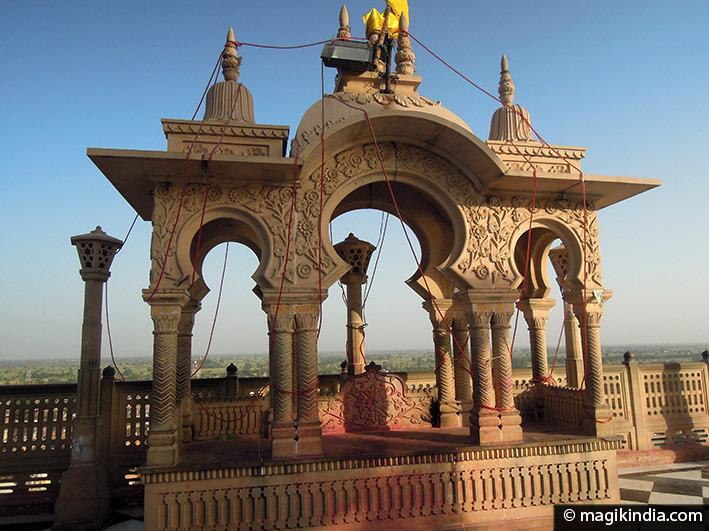 At this festival they are thrown from the top of the Radha temple onto the crowd below, who try to catch them. They are regarded as prasad – holy food – and are treated with great respect. 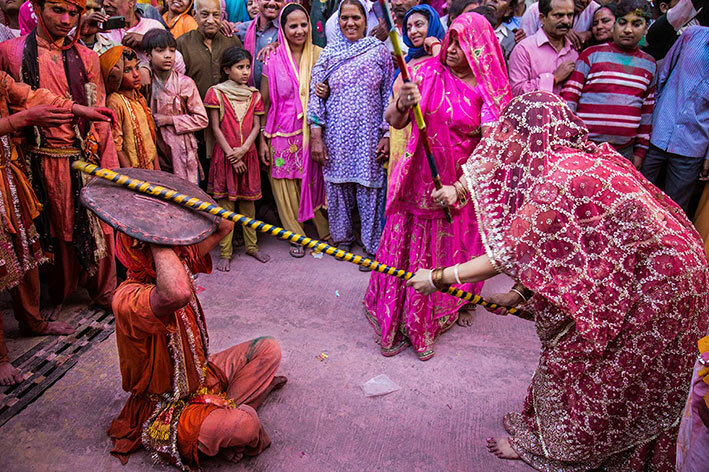 The literal meaning of Lathmaar Holi is “Holi with stick-beating”. Legend has it that when Lord Krishna was living in the neighbouring village of Nandgaon, he used to visit Barsana where his beloved Radha was born. The dark-faced god enjoyed teasing Radha and her gopi friends (gopis are cowherd girls). The girls took offense and chased him out of town. To relive the legend, the men of Nandgaon come to Barsana during Holi and are greeted by the women of the village armed with long sticks called lathi. 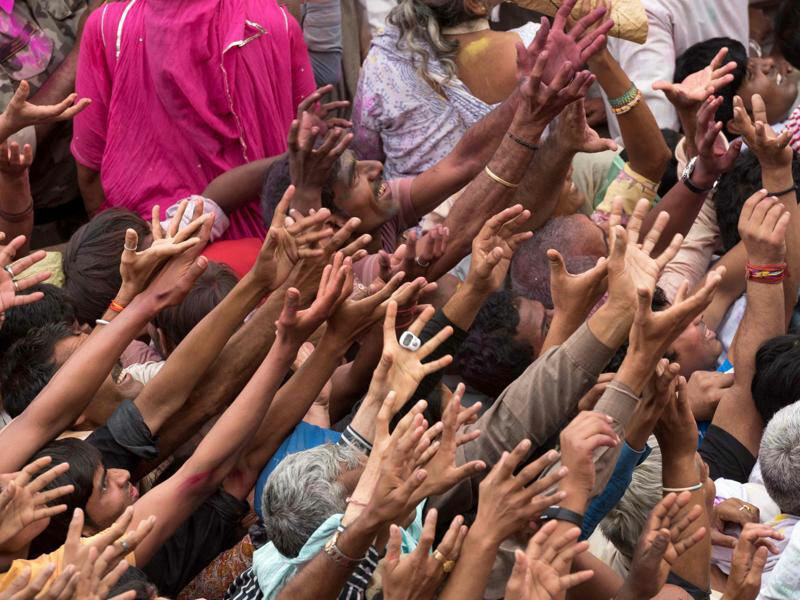 The Nandgaon men chant verses to provoke the women, who set about them with their sticks. The men use shields to protect themselves. The next day the women of Barsana go to Nandgaon and are drenched with coloured water by the men there. Your information is very useful. I love to read this. You can read about the parikrama of barsana here.